Operation Fardh al-Qanoon, or Enforcing the Law, began on February 13, 2007. The primary mission of the Baghdad Security Plan, as the Fardh al-Qanoon is also called, is to secure the Iraqi population. The principal targets of Fardh al-Qanoon are al Qaeda, Sunni insurgent, and Shi'a extremist elements in Baghdad. In addition, the operation aims to build the capacity of and demonstrate the legitimacy of the Iraqi government. Fardh al-Qanoon differs greatly from Operations Together Forward I and II (OTF I and II), as it adopts a new strategy for counterinsurgency. This involves troops living in the neighborhoods, interacting with residents, and gaining intelligence about the enemy. U.S. forces have moved from their large Forward Operating Bases in and around Baghdad, into smaller Joint Security Stations (JSSs) and Combat Outposts (COPs) located in nearly every neighborhood in the city. This has brought U.S. and Iraqi forces closer to the population they are protecting. Also, in the JSSs, members of the Coalition Forces, Iraqi Police, and Iraqi Army live and work together, in order to improve coordination and conduct of security operations. Under Operation Fardh al-Qanoon, the “clear, hold, and build” strategy of OTF I and II was replaced with a “clear, control, and retain” strategy. This new strategy has a greater emphasis on controlling and retaining neighborhoods, so as to prevent enemy reinfiltration and secure the population. The new strategy placed population security first, unlike the previous method, which emphasized the pace of clearing and transitioning to Iraqi Security Forces. The new strategy under Fardh al-Qanoon also placed a much larger emphasis on long term investment neighborhoods, rebuilding essential services and political and economic institutions, than had OTF I and II. Finally, under Fardh al-Qanoon, U.S. forces are permitted to conduct operations against extremist elements to go into Sadr City. This was not the case during OTF I and II, and it was a major reason for the failure to quell sectarian violence in late 2006. Under the “Surge,” an increased number of U.S. forces are participating in Operation Fardh al-Qanoon. The first of the surge brigades arrived in Baghdad in February 2007 at the start of Fardh al-Qanoon. That same month, new U.S. and Iraqi forces moved into Baghdad from elsewhere in Iraq. Currently, there are seven U.S. combat brigades operating in Multi-National Division-Baghdad (MND-B) and participating in Fardh al-Qanoon. Since its inception, Fardh al-Qanoon has had great success in reducing violence in Baghdad. By late September 2007, there had been a 50 percent decrease in the number of attacks in Baghdad. The decrease in car bomb, mortar, and rocket attacks was even greater than 50 percent. Fardh al-Qanoon, together with the Operations Phantom Thunder and Phantom Strike, has even helped to improve the security situation through much of Iraq. 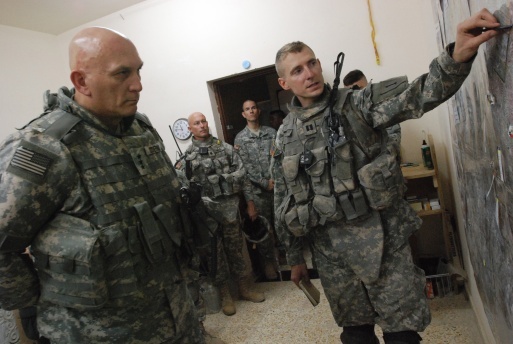 In November 2007, Lieutenant General Raymond Odierno, commander of Multi-National Corps-Iraq, reported that the number of enemy attacks in Iraq, the number of attacks against Iraqi civilians, and the number of murders in Baghdad, dropped to levels that last existed in early 2006, before the first Samarra mosque bombing.